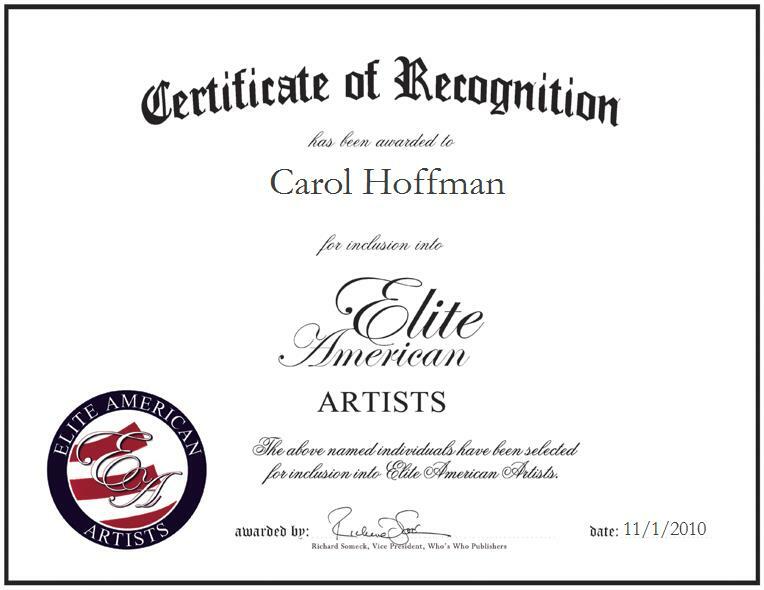 Palmyra, Pennsylvania | November 1, 2010 | Carol J. Hoffman, Artist, Writer, Musician, Designer, and Inspirational Speaker at CJ Hoffman Musings, has been recognized by Elite American Artists for her expertise, dedication, and leadership in arts and entertainment. Ms. Hoffman excels in writing music, cookbooks, children’s books, self-help books, and creating artwork and acrylic painting. Her art has been represented at many national and international art shows and she still tries to get together with her artist friends to put on shows locally once a year. She is represented by galleries in Pennsylvania and her compositions will soon be added to a CD of her own making as a gift to those who are in nursing homes. Her original cantata is being considered for performance in the church where she and her husband began their ministry many years ago. She has also dabbled in many writing genres over the years. Her favorite creation has been a three-book series of mind tools; “The Joy Reminder,” “Inside the Honey Walls,” and “An Elegant Echo.” In addition, her books “Hiss,” and “The Dragons and the Simmies” will be available on Apple’s iPad soon, and the children’s book “Ali Smiles,” will be going into publication at the beginning of 2011. Her radio talk show was a highlight of 2009’s foray into that medium. She plans to return to it at some point because of the richness it has added to her life. Meanwhile, she is putting together a full-length seminar about forgiveness. She has completed industry-related training programs and stays current with the trends in her profession by reading Scientific American, The Artist’s Magazine and National Geographic. A graduate of Susquehanna High School, Ms. Hoffman holds certifications in public speaking, economics, inventory management, computer language and logistics. She is affiliated with the Metropolitan Museum of Arts, the Planetary Society, the National Museum of Women in the Arts, the Nature Conservancy and the Smithsonian Institution. She also volunteers her time to the Bethesda Mission, the local Children’s Shelter, and Food for the Hungry; she is also a nominee for the Board of Directors of the Domestic Violence Initiative for Women. She attributes her success in her over 48 year professional career to her perseverance and faith in God. She understands that quality work takes time; she suggests that with patience and a strong work ethic any one can succeed in their endeavors. For more information on CJ Hoffman Musings, visit http://www.cjsartco.atomicshops.com.